What's that jingling I hear? It must be . . . It's our biggest event EVER! Come along on Sunday 8th to enjoy some top quality vintage Christmas browsing with . . .
★ Over 70 traders offering a dazzling selection of authentic vintage clothing and accessories for men and women, as well as vintage jewellery, homeware, textiles, decor, small furniture, collectables, curiosities, and a dash of crafts with a vintage flavour. ★ The Vintage Village Christmas Marquee on the Mile, with even more vintage traders! ★ Ooh Betty's amazing Mobile Retro Christmas Grotto and Pop-up Shop in a Sprite caravan! ★ The delightful Paul Harper and Katie Spitfire to entertain you with Christmas melodies. ★ Kegs & Co vintage cocktail bar serving hot mulled wine, special German lager and Advocaat Snowballs. It's the most fun you can have shopping for unique Christmas gifts you won't find anywhere else! You'll need to keep your strength up with some hot and hearty nourishment, so we've lined up the very best for you - the stupendous Lord of the Pies with their award-winning handmade British and traditional pies and - NEW to VV! - The Green Griddle, serving their gastronomic, gourmet and green café style street food from a converted vintage Citroen H van. Menus will be here added as soon as we get them. Kandoo Mobile Coffee will be on hand purveying the finest espresso-based coffees and a selection of teas, and The Vintage Village Visitors' favourite trader (official! ), Stuart Thornley Cake Design, will offer a droolsome array of cupcakes and delectable sweet treats. Cold wrapped pies available to take home - stock up for Christmas! If you would like anything reserving for collection please let us know by Monday 2nd December at the latest. Thank you. And finally, here's our list of super duper stallies who will be eagerly awaiting your arrival at The Merry Little Christmas Fair. Don't let them down! Allsortz - vintage homeware, ceramics, glass. NEW! Annie's Vintage (in the Christmas Marquee, Friday and Saturday; in the Market Hall on Sunday) - quality vintage men's and women's clothing, 1920s-80s. She's come all the way from Cornwall! Aspidistra Vintage (in the Christmas Marquee, Saturday) - vintage homeware, costume jewellery, ceramics and glass 1920s-70s. NEW! Big on Retro - mid-century modern homeware, ceramics, small furniture; handmade cushions and lampshades using vintage fabric. Black Cat Vintage (in the Christmas Marquee, Saturday and Sunday) - vintage clothing and hats. Boomerang Vintage & Retro - 1950s-60s homeware and furniture. BRG Collectables - collectables (yes, really), militaria, vintage men's and ladies' wear. Buttercups and Jeans Vintage Bitz (in the Christmas Marquee, Friday, Saturday and Sunday) - vintage items both home and personal from the 1920s-60s. Cancer Research UK - vintage clothing, accessories, homeware. Eclectique Chic - vintage jewellery, handbags, collectables and clothing. NEW! Essentially Eagle (in the Christmas Marquee, Saturday and Sunday) - mid-century clothing, accessories, small furniture and homeware. For the Love of Vintage - vintage china, vintage china up-cycled gifts including cake stands and candles. Garrick Books (in the Christmas Marquee, Friday, Saturday and Sunday) - vintage, antiquarian and collectable publications. Garbo Antiques - fab vintage clothing and accessories for men and women, 1880s-1960s. jamessharpart (in the Christmas Marquee, Friday) - hand printed textile collage art, including journals, aprons, stuff stashes and shoulder bags. Jodi Jo Retro - handmade goodies including cushions, animals softies, badges, magnets and greetings cards, using vintage fabrics and wallpaper sourced from around the world. NEW! Knick Knackery - mid century homeware and clothing. NEW! Little Sparrow - vintage clothing, accessories, jewellery and furniture, 1950s-80s. Lonsdale Avenue - vintage homeware. Maureen Woodman - ceramics, glass, cutlery, jewellery, haberdashery and books. Moo Vintage - mid century homeware, costume jewellery, clothing and accessories. Mr Vintage - mid-century men's and women's clothing, accessories and homeware. Munkispanner - vintage women's and men's clothing and accessories, 1960s-70s; handmade upcycled women's 1960s style Mod clothing. Oooh Betty! with her Mobile Retro Christmas Grotto and Pop-up Shop in a 1970s Sprite caravan (in the Christmas Marquee, Friday, Saturday and Sunday) - vintage inspired cushions, vintage peg doll kits; vintage toys, homeware, kitchenalia, luggage. 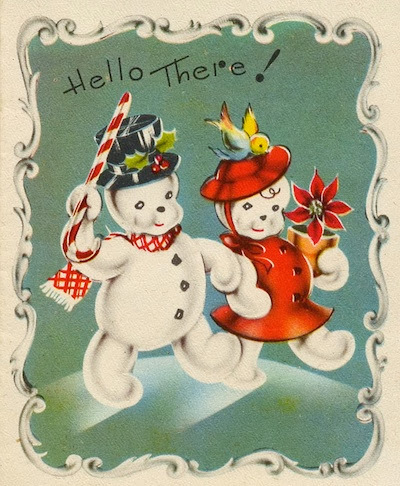 Mr and Mrs Snowman can't wait to come along to The Vintage Village! Source. Maurice the caravan is being transformed by Oooh Betty! See the final result on Friday 6th, Saturday 7th and Sunday 8th December at our Merry Little Christmas Fair. And read about it on Oooh Betty's blog. 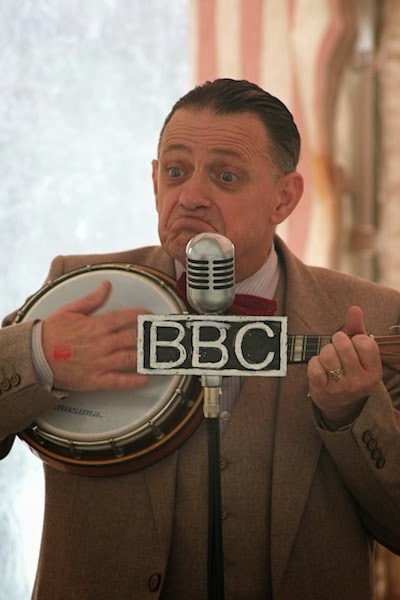 The delightful Paul Harper will be here to entertain you at our Merry Little Christmas Fair. Photo by Andrew Ayres. 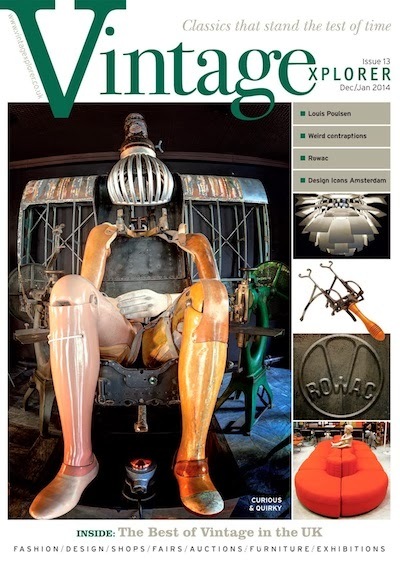 The new issue of Vintagexplorer looks most intriguing! We'll have a load for you to help yourselves to at Sunday's Fair, for FREE! - they'll be at Room at the Top Vintage Goods. 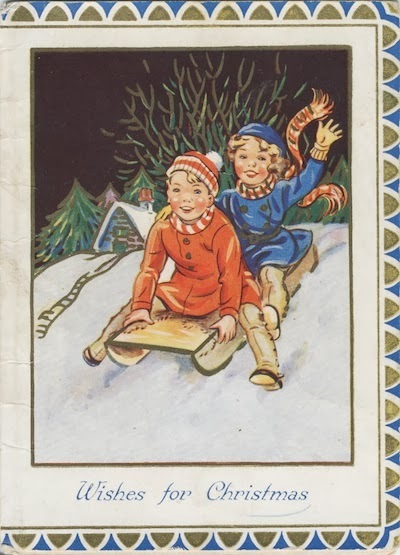 One example of an amazing range of vintage Christmas ephemera from Eclecta Books, available at Room at the Top Vintage Goods. Raiders Vintage - women's vintage clothing and accessories, including hats, shoes, boots, sheepskins and furs, and a selection of jewellery, 1940s-80s. Retrorags 106 - vintage men's and women's clothing, accessories and bags. retrospektiv studio - vintage collectables, decor, homeware. Rita Black - vintage collectables, decor, homeware. NEW! Sarah's Second Chance - vintage homeware, collectables, clothing and accessories. Serendipity - vintage kitchenware, tea sets, accessories, costume jewellery. Shabby Cheek - items of interest and intrigue. Shady Lane Vintage - women's clothing, bags, jewellery, books, magazines, homeware, 1940s-80s. Sheila's Store - lots of vintage costume jewellery. Show Us Your Threads - featuring Ophelia Button: vintage women's fashions and accessories, homewares 1950s-80s; handmade headbands, bow ties and vintagely-dressed peg dolls. Snygg - "Stockport's funky pot royalty" returns with an even bigger and better selection of stylish mid-century items for the home, including furniture. Stuart Thornley Cake Design - your favourite Vintage Village trader, official! See details of this month's specials above. Sue Booth's Sparkle - vintage jewellery and collectables. suzylovesmilo (in the Christmas Marquee, Friday and Saturday; in the Market Hall Sunday) - women's vintage clothing and accessories, homeware, ceramics; upcycled vintage clothing and accessories. T.E.A. (in the Christmas Marquee Friday, Saturday and Sunday) - mid-century kitchenalia, homeware, collectables; women's and men's clothing 1960s-80s. Tea for Two Vintage (in the Christmas Marquee, Saturday and Sunday) - vintage bric-a-brac, accessories, jewellery, teacups and party ware; teacup candles and bunting. The Lost & The Found - vintage homeware, jewellery, ephemera and general found items. NEW! The Major (in the Christmas Marquee, Friday) - antique and vintage homeware, decorative items, jewellery and collectables. NEW! Timeless Vintage (in the Christmas Marquee, Sunday) - vintage men's and women's clothing and accessories, 1950s-80s. TinTrunk - a growing range of vintage luggage plus apparel for ladies and gents, jewellery, homeware, textiles, collectables. Find TinTrunk at Room at the Top Vintage Goods. NEW! Tramp Gems - antique and vintage costume jewellery and fashion items. Village Vintage Clothing - men's and women's vintage clothing, accessories and jewellery. Up at Room at the Top Vintage Goods, and in the Christmas Marquee, Friday, Saturday and Sunday. Vintage Things Forever - vintage kitchenalia, homeware and interesting items. NEW! We Used To Have One Of Those (in the Christmas Marquee, Saturday and Sunday) - vintage photographic and audio visual equipment, early to mid century homeware, books, ephemera, comics, toys and games.